Iowa Senator Joni Ernst, a Republican from Red Oak, joined a bipartisan group of Senators today to call on the president to provide defensive weapons to the Ukraine in the fight against Russia rebels. Ernst says she visited the Ukraine many years ago on an agricultural exchange when the country was still part of the former Soviet Union. “We did not talk about agricultural practices as I anticipated, what we talked about was what it was like to be free and what it was like to be an American. Those were the things that the Ukranians wanted to know. They wanted to know about freedom and democracy,” Ernst says. Ernst says the Ukraine eventually moved forward to become a free country. “They are a sovereign nation, they are an ally. And so I am in full agreement that we do need to provide lethal assistance to our friends in Ukraine, to President Poroshenko, to push back on egression coming from president Putin and Russia,” Ernst says. The news conference was called by Arizona Republican Senator John McCain and Democrat Rhode Island Senator Jack Reed, the chair and ranking member of the Senate Armed Services Committee on which Ernst serves. 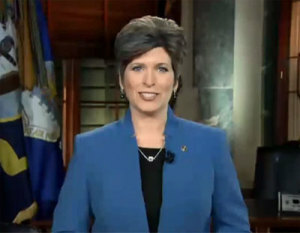 Ernst summed up her remarks by saying the world is watching the United States on this issue. While the senators are pushing for the authorization of lethal aide, U.S. Secretary of State John Kerry is urging Russia to come to a diplomatic solution to end the conflict in the eastern Ukraine.